Is access to international gateway from 670 east available? what concourse are Sun Country gates in? what concourse does Sun Country use in Columbus? 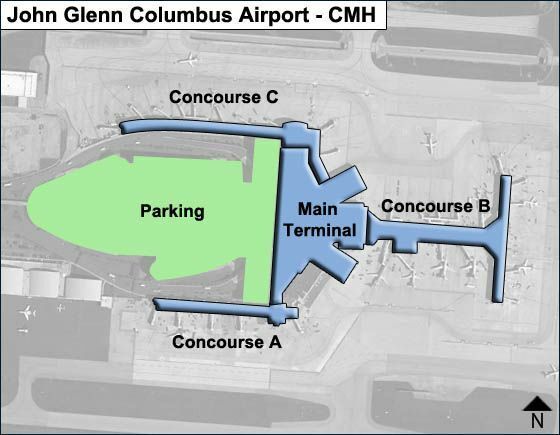 The Main Terminal at Port Columbus John Glenn Airport houses Concourses A, B, & C - Concourses A & C are south of the ticketing level (A right, C left), accessible via separate security checkpoints on opposite ends. Concourse B at center is north of the ticketing level, accessible between check-in counters on either side, via security check. A new inline checked baggage screening system replaced five stand-alone screening areas, eliminating the need for passengers to walk their checked baggage to these screening locations before proceeding to their gate. The Terminal's 72-inch screen - a high definition and full motion video wall system - has won highest honor at the 2012 DSE Expo. Upon completion of the substantial Terminal Modernization Program in March 2016, the ticket lobby, baggage claim & concourses A,B,C received a facelift; technology & security upgrades were made; and new terrazzo flooring, comfortable seating, upgraded restrooms, new restaurants, and high-speed WiFi were installed - making the terminal a more modern, airy, comfortable and easy-to-navigate facility. The two lounges trace the Airport's history with a large mosaic depicting cultural scenes of Columbus, and an exibit of notable Ohio aviators. NOTE: The Currency Exchange service (tel. 614-237-9224) also offers: fax/copy, notary, flight insurance, stamps & envelopes, self-service FedEx & UPS drop boxes. The baggage claim level of the Main Terminal has 7 baggage carousels, information desk, hotel & flight information. International Arrivals is near the Meditation Room (between bag carousels 5 & 7). The ticketing level of the Main Terminal with a total of 9 check-in desks - divided on either side of the elevator/escalator, offers an array of amenities & services (information desk, ATMs, USO lounge, concessions, and access to the Concourses via separate security checkpoints: checkpoint C is to the left , checkpoint A is to the right and Checkpoint B is beyond the check-in counters, at center. Concourse A with gates A1-A6 - accessible from southeast of the ticketing level - is used by Southwest. It encompasses over 29,200 sq.ft of space and offers new concessions. Concourse B with gates B17-B36 - accessible from center, north of the ticketing level - is used by Air Canada, American Frontier & United and offers 4 concessions. Concourse C with gates C46-C56 - accessible from southwest of ticketing level - is used by Delta, and offers concessions. Gate C46 is for International Arrivals with Customs closeby. The new American Craft Tavern opened in July 2017, while more food & dring options will be added. NOTE: Frontier Airlines & Vacation Express may use either of Concourses A,B,C gates.